Subject: Home made Crystals ? I think the Crystals look beautiful and shouldn't take much to make a few. I want crystals, like the ones in Niagara - they're the only things that feel cheap in this game. They don't feel nice though. Looking to buy some cheap ones from China - keywords: acrylic, confetti, diamonds. Seems like you can buy 1000 of them, in one color, for 1$ (shipping included). just to speed up the visual aspect.. This was done not too long ago. 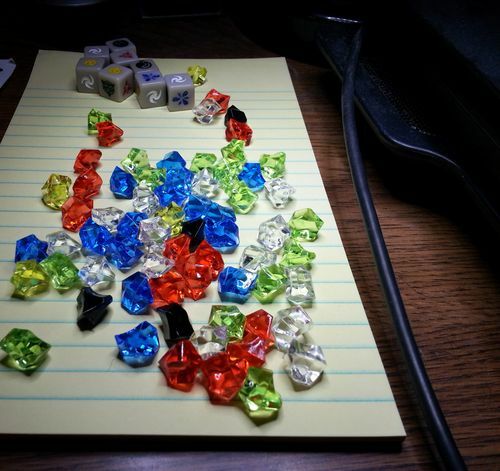 One of the BGG users ordered a bunch that look like the above picture. I ordered a set from him and I'm very happy. My only (minor) complaint is that the green is a little light. Oddly enough, the green shows up better in the picture than in real life. If you look through the light shining through the green crystals (like the ones along the right side), you can see how the color lightens up. Anyway, another option to pursue. In my opinion, these are a major improvement, especially from the cloudy/murky ones from The Lost Legion expansion. My only (minor) complaint is that the green is a little light. The 10mm darker green gems seem to be out of stock in most shops. I luckily got them from my local game store, Fantasiapelit, here in Finland. They still have them in stock. However, if you would like to make your set perfect, you could also get a game called Escape: The Curse of the Temple. It's not that bad game either, atleast if you like quick 10 min dungeon crawler. It has 25 gems of exactly the same shape and size as the ones you have, in darker green color. They are also exactly the same as the ones I bought from Fantasiapelit. Forward 1, Forward 2, Forward 3... siege attack 5? Why for this life there's no man smart enough, life's too short for learning every trick and bluff. Pshaw. I'm planning to go to my local lapidary and buy real crystals. Seriously though, the stock pieces disappointed me and I'll probably end up checking a local craft store for beads or rocks or something for use in this game and several others (e.g., some red stones for wound counters in Summoner Wars). Very neat. Yes, I did consider Escape, but I can't get enough people in my gaming group to play Space Alert (hey, another Vlaada game!) which I love, so I figured Escape would gather dust. Aren't you the same guy who stores his tiles in that round CD case? You got a link where one can get one of those? My storage solution still has the tiles loose in the box.